The majestic symbol of San Francisco recognized around the world spans the entrance to the Bay, from the north end of the San Francisco peninsula to Marin County; the location of the picturesque communities of Sausalito and Tiburon. Guided Golden Gate Bridge to Sausalito Bike Tour. It’s thrilling, scenic and good for all ages. Daily 3-hr narrated tours begin at Fisherman’s Wharf, travel past Aquatic Park, Fort Mason, over majestic Golden Gate Bridge and into quaint Sausalito, where the tour ends. 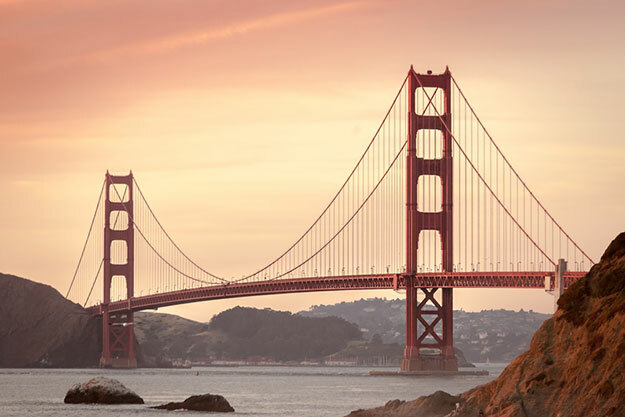 From there, use your included ferry ticket to return across the bay to Pier 39, or take time to explore beautiful Sausalito browsing through shops, art galleries and enjoying delicious food at your leisure before taking the ferry back. California Sunset Tour by Bike. Pedaling over Golden Gate Bridge at sunset is a gorgeous sight. Start out the 3 hour narrated bike ride along the Bay, through the Presidio and over the Golden Gate Bridge! Amazing views, even paths, wonderful photo ops. Big Bus San Francisco Tours. Not only do you ride across the iconic bridge, both ends are two of the 20 hop off stops on this comprehensive San Francisco tour.For first-time visitors who want to see the great bridge and countless other San Francisco highlights from a high vantage point while riding comfortably, this narrated tour is the ticket. Golden Gate Bay Cruise departs from Pier 43 in Fisherman’s Wharf for a 1-hour cruise along the picturesque waterfront, past the Presidio, under the soaring Golden Gate Bridge before it turns to come back, past Marin Headlands and quaint Sausalito, Angel Island and a slow cruise around eerie Alcatraz island. If you’re into bridges and views from the water, take the 90 minute Bridge 2 Bridge Cruise, under both the Golden Gate Bridge and the Bay Bridge, taking in all the city and bay sights between the two. A note on walking over the Golden Gate Bridge: you can, but finding parking and understanding where to start and end can be challenging for first-time visitors as can the press of people walking and bike riding. To walk, start from the East Sidewalk, the only pedestrian walkway, head out to one of the bridge towers and back (30 min.) Or, walk about 1.5 miles to the middle of the bridge and back. Dedicated walkers will want to walk the 3 miles to the Sausalito side and back! Embarcadero, Fisherman’s Wharf & the Piers. San Francisco’s bustling, colorful waterfront, the Embarcadero, stretching from AT&T Park, through Fisherman’s Wharf and on to Ghirardelli Square, is many things at once – home to a fishing fleet for over a century, tourist destination, departure point for bay cruises and ferries, and piers lined with places to see, things to do, places to eat and shop. Check out this artisanal food market at the foot of Market St, lined with cafes, restaurants, coffee, and tea shops, cooking gadget shops, pastry shops, ice-cream shops. Tues., Thurs. and Sat, walk through the Ferry Plaza Farmers Market, one of the best in the country. Pier 15 is the intriguing Exploratorium has over 600 amazing hands-on science exhibits. 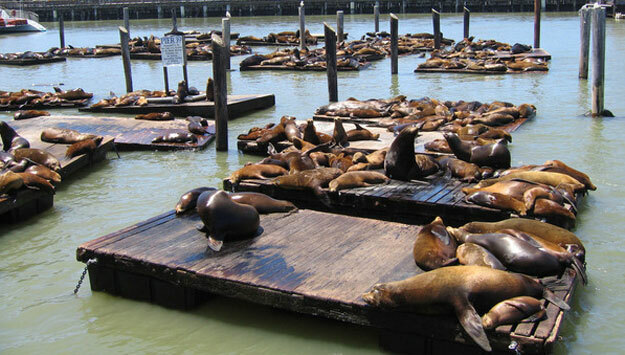 Pier 39 has souvenirs, food stands, restaurants, historic merry-go-rounds, lounging seals are just some of the things to see and do in the 3rd most visited tourist attraction in America. Aquarium of the Bay is the place to see exhibits of aquatic animals living in the distinct ecosystems that support the Bay’s diverse marine life. The walk through 300 ft. clear tunnels surrounded by thousands of the Bay’s marine life swimming by is awesome! Pier 41 is the take-off point for ferries to Sausalito and Tiburon. Fisherman’s Wharf has the most historic and popular must-see Fish Alley and Fisherman’s Chapel. Have fresh Dungeness crab cocktail served in a cup or a sourdough bowl of chowder straight from a crab stand. Play old-time coin-operated mechanical games and music at Musee Mechanique on Pier 45. See 3 rare historical vessels at the Maritime Historical Park; a submarine and more at Hyde St. Pier National Park. Walking and stopping along the Embarcadero takes time, but it’s pleasant and interesting. Find the area you want to visit and focus on that. Taking the Wharf & Waterfront Segway Tour. Great for families with kids 12 and up. See it all gliding around on a Segway through Fisherman’s Wharf, around Aquatic Park, Hyde St. Pier, Maritime Museum vessels, Ghirardelli Square, and more. Super-fun with lots to see. The huge swath of green cutting through the middle of the city has a quiet serenity and plenty to see: Academy of Sciences, DeYoung Art Museum, Japanese Tea Garden, Botanical Gardens, meadows, Stowe Lake, even bison grazing in a paddock. Academy of Sciences is a must see. It’s where you can experience one of the most biodiverse aquariums in the world, a rainforest teeming with plants and animals; a planetarium with an immersive universe in an all-digital dome; a natural history museum of the earth, past and future, and a living green roof!Have lunch in Academy Café. de Young Museum exhibits a remarkable collection of American Paintings, decorative arts, textiles and costumes from the 17th to 21st Luncheon de Young Café. If you’ve opted for the Big Bus San Francisco 24 Hour Tour, your tour goes through Golden Gate Park, with a hop off at the Academy of Sciences. The de Young Museum is within walking distance. Golden Gate Park Segway Tour is a memorable 2.5 hours narrated glide through the eastern section of the lovely 1170 acre park filled with all the must-see places – the Academy of Sciences, de Young Museum, multiple diverse gardens, Music Concourse and many hidden places too. Interesting, fun and with many photo op stops along the way, it’s a great way to see the signature park for anyone comfortable on a Segway, ages 12 and up. Home of the San Francisco Giants where America’s favorite pastime is played, is one of the coolest sports stadiums on the west coast. There’s something magical about the place. While stadium facilities are state-of-the-art modern, it has the look and feel of a classic ballpark. On tour, walk on to the field, imagining the roar of crowds, and into the dugout, feeling the quiet intensity of the players watching strategy unfold. Step into the Batting Tunnels where you can almost hear the crack of a bat. Imagine the anticipation of visiting teams as they suit up in the Visitors’ Clubhouse. Try out seats on different levels, soak up views of San Francisco Bay, and check out the amenities in luxury suites and the Field Club Lounge. Step into the Press Box, where broadcasting greats have called the game. 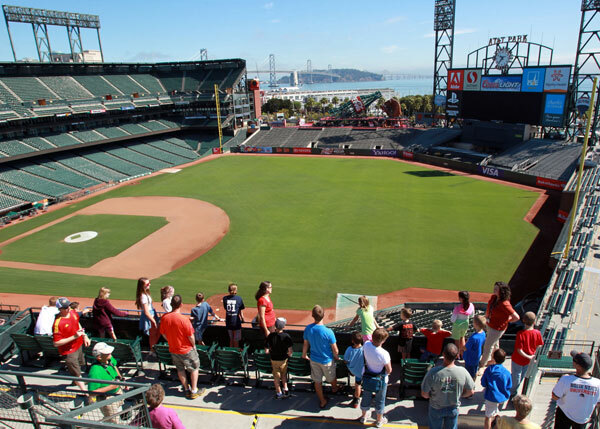 Let the kids explore interactive Coca-Cola Fan Lot, a mini-AT&T Park play area complete with video scoreboard and speed-pitch game. This interactive tour is a home run for the entire family! Telegraph Hill/Coit Tower/Filbert& Greenwich Stairs: Three unique San Fran experiences all in one. Walk to the top of one of San Francisco’s famous hills, Telegraph Hill, via one of the city’s famous hidden stairs, Filbert Stairs, which lead to Coit Stairs, to reach iconic Coit Tower at the top where panoramic views are fabulous. Russian Hill: A thrill of a ride for Advanced Segway riders only happens on Crooked Streets & Hills Segway Tour. 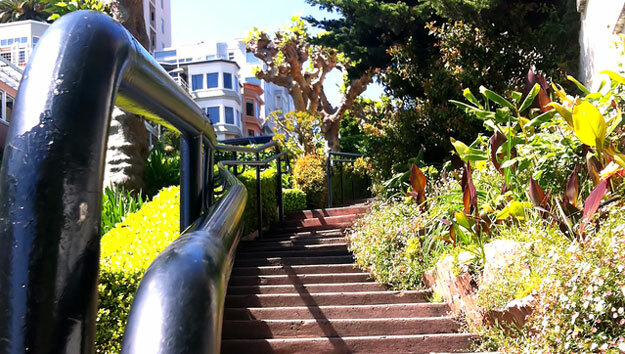 Up Russian Hill, down the most crooked street in the world, Lombard St, along with the waterfront, around North Beach and Little Italy with glimpses of the city’s famous hidden stairs and paths make it an amazing 3-hr ride. Great climbs and fabulous city view. Muni has downloadable maps. Take the Historic Streetcar from Pier 39, take Muni’s historic streetcar F-Line following the Embarcadero south before turning on to Market and heading all the way to the Castro District. 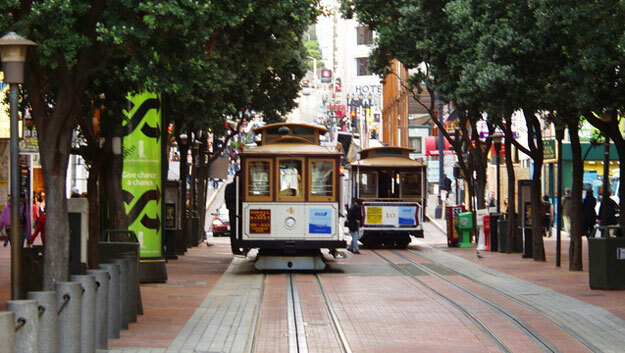 Take the Historic Cable Car from Hallidie Plaza at Market St. take the cable car up Powell, along Nob Hill and down to Ghirardelli Square. Along the way exit the cable car at any stop to explore out what’s around it. At the end of the line at Hyde and Beach, grab a coffee at the Buena Vista Café. The Powell/Mason follows a similar route separated by streets and hills, ending up within walking distance of Fisherman’s Wharf near Pier 39. 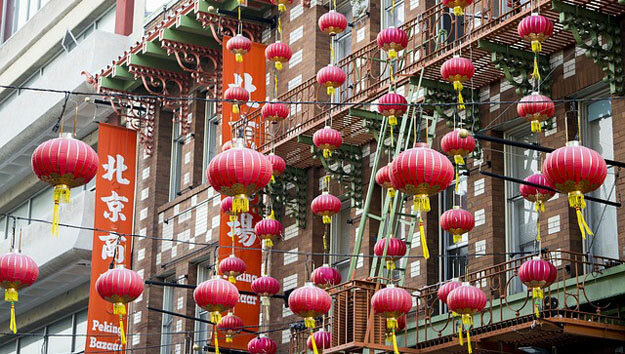 Enter through ornate Chinatown Gate into the colorful, crowded, bustling and busy, densely populated neighborhood with the largest Asian population outside China. Grant Street,the main tourist street, is lined with most of the cheap, fun-to-take-home trinket shops. Venture off Grant to explore side streets. Find genuine Asian antiques in stores along Stockton, Bush or Clay. Find colorful Buddhist temples on Waverly Place. Taosit Kong Chow Temple on Washington has splendid altars. Get in line at Golden Gate Fortune Cookie Company on Ross Alley for egg tart or moon pie, or Golden Gate Bakery on Grant for a melt-in-your-mouth custard-filled confection. Spend a half day in this charming small town just across the Golden Gate Bridge. Browse through art galleries and shops along Bridgeway St. Stop for wine tastings, grab a picnic takeout at a deli to enjoy sitting along the waterfront with fabulous views; relax over a delicious lunch at one of many small restaurants. Walk along the waterfront, taking in the colorful, eclectic “Floating Houses,” and to the Bay Model, a fascinating over 2-acre research and education facility to view the complete bay-delta system in three dimensions in real life, complete with real water and “real” tides. The Golden Gate Ferry over from the Ferry Building; Blue & Gold Ferry from either Pier 39 or Pier 41. 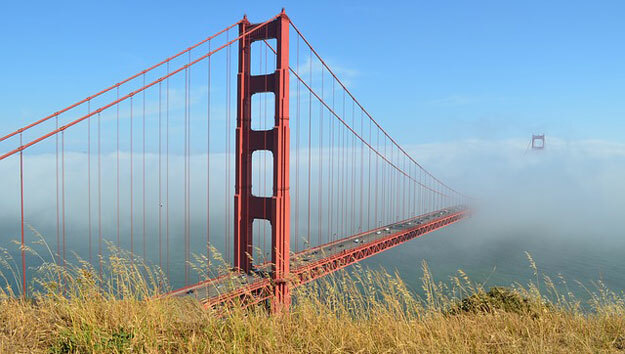 Get there on the Guided Golden Gate Bridge to Sausalito Bike Tour. It’s a thrilling ride over the iconic bridge. Spend as much time as you like exploring Sausalito and use the ferry ticket that comes with the bike ride ticket to get back to Pier 39. Go San Francisco Card. Put together a day at considerable savings by choosing from a list of 27 great choices ranging from attractions, museums, bay cruises and excursions. CityPass has discounted packages. It includes Muni & cable car transportation, a Bay Cruise, Academy of Sciences, and pick one of 2 museums and one of 2 aquariums. Good for 7 days, it covers all the bases. San Francisco Explorer Pass. Choose 4 experiences from a great mix of 20 of San Francisco’s attractions, museums, excursions, and cruises. One of the 4 is a 1-day Muni Visitor Passport to get around and experience a cable or vintage streetcar ride at the same time. Another is Big Bus Hop off/Hop on Sightseeing Tour with 20 great stops.The attraction choices include the museums listed above.Savings are substantial!